…the blindfold slips a fraction. I can see a little through my right eye; there isn’t a lot of light, but I see metal bars in front of me, all around me. A glimpse of the cages on either side: a man, no more than forty, cowering in the corner of his. A woman––the one who’d told me I’d get myself killed––is transfixed by something right in front of her, tears tracking down her cheeks. Okay, so that’s actually part of the title story, PAIN CAGES. As you can see, our protagonist Chris is in a little bit of a situation, in that he’s been kidnapped and locked in a hanging cage. He’s not alone, as there are several other cages with varying occupants surrounding him. The story centres around Chris’ plight to escape his cage, and find out the identity of his captors. The subplot revolves around interludes, flashbacks to varying points in the past that Chris must connect to his present condition. The interplay between the past and present is confusing at times, though they do tie themselves up by then end of the story. Religion and death play enormous roles as themes, and are executed very well. The ending isn’t terribly original, but it is a convincing twist to the story that the reader thinks Kane is building. Graphic violence and gore are kept to a minimum, but are done exceedingly well and have an emotional impact on the characters that can sometimes be lacking in these types of stories. The emotional turmoil at the conclusion is a fitting end, though it might seem forced to some readers. Overall, I enjoyed this story immensely. HALFLIFE documents what happens to teenage werewolves when they grow up and are forced to deal with the consequences of their misguided youth. A hunter stalks the secretive group of middle-aged lycans, picking them off one by one without any hint of his reasoning. The characters run the gamut that you’d expect: the boss, the pretty boy, the family man and so on. The subplot centres on Neil the family man and his continued persistence that his life can be simple (he just has to go to work for a 3 day weekend once a month, no big deal). Kane explores inner turmoil combined with marital apathy to drive the reader to feel sympathetic for Neil and his struggle for normalcy. The werewolves kill discriminately, select their targets carefully and hide any evidence before day breaks. This is a truly refreshing take on werewolf lore, especially given the fact that the story is set in the present, and a rabid monster would most likely become extinct rather quickly. I’m a bit of a sucker for werewolves, but even without my prejudice this story satisfies. Kane next brings the reader on an astrological train ride. SIGNS OF LIFE quite simply revolves around a passenger train derailment and how it affects each survivor. The scenes are spliced with horoscopes, the signs determined by which character(s) will be focused on in the upcoming passage. I found the interludes to be intrusive and detrimental to an otherwise well-crafted story of human perseverance. The characters are complete and mostly believable. In comparison to the prior two entries, this story is tame and not necessarily what I’d consider horror. The final story is emotional, challenging, and eerily creepy. THE LAZARUS CONDITION focuses on Matthew, a man trying to put the pieces of his past back together. Kane crafts a brilliant tale, weaving trauma, distress, religion and death into an intricate tapestry affecting Matthew and all of the supporting characters. I am purposely leaving out one rather massive plot point, because you need to read this story. It’s not exactly horror, but it doesn’t need to be. I was attached to almost all the characters (Father Lilley annoyed me, but that’s totally subjective) and the gore, again while not abundant, is done properly and has a deeper impact on the story than simply being there for splatter effect. 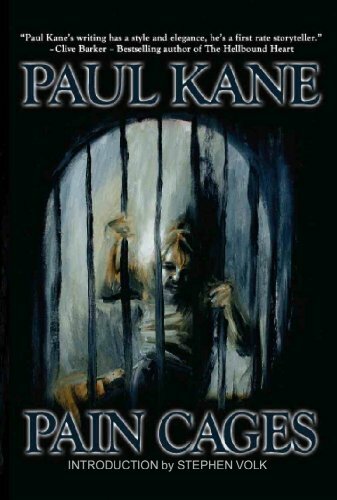 Pain Cages is a book I’m happy to have read. While it can be argued that two of the stories aren’t really horror, the overall vibe of this tome is creepy, and well worth a look. To pick up your copy of Pain Cages, visit the Books Of The Dead store. For more information about Paul Kane, visit his website.